Online customer survey tools are a great way of engaging with your customers and discovering insights into various areas of online performance. For example, you can use survey tools to trace product feedback, carry out market research, measure customer service, the performance of your newsletters and much more. But which online customer survey tool is best for your business? Let’s take a look at one in particular: Qualtrics. Qualtrics is an online customer survey tool that somewhat pushes the boundaries of traditional surveys. It gathers feedback (via website, mobile and email) using transactional and pulse surveys and offers a number of different features such as display logic, email triggers and logic branching. Users have access to their own role-based dashboards and can view results in trend vs. target charts. There is also a closed loop ticketing feature that notifies users of customer interactions, such as the presence of a detractor. However, as with many survey tools, there are some setbacks (according to some users) to working with Qualtrics including limitations in customisation (e.g. editing end of survey messages). This tool is also a bit on the pricier side which means it’s not entirely suitable for all business sizes (especially non-profit and smaller organisations). Note: pricing can vary depending on factors such as which modules of the system you want to use, what kinds of response volumes you want to receive and if you choose to make use of add-on services such as support. Mopinion is a feedback analytics software that collects and analyses both website and mobile customer feedback (via a mobile SDK) in real-time. Users can build, design and configure feedback forms however they like. They can also target specific groups of online visitors with feedback forms and gain insights into why they are struggling to convert. This is done using advanced triggers that are set off based on digital visitor behaviour. Users can deploy forms either in modal, slide-in or embedded on the page. Upon collection, feedback items can be visualised in customisable dashboards and charts for advanced analyses. Additionally, digital teams can share and take action on these feedback items in a timely manner with the help of smart alerts. Zoho Survey is an additional survey creation tool that offers an unlimited number of surveys that include up to 15 questions. Surveys can be shared on social media channels, embedded on your website or opened using a QR code. This tool is great for businesses who want to integrate their survey tool with a CRM (e.g. Zoho CRM). Note: ZohoSurvey is a very simplistic tool and therefore, doesn’t deliver the more advanced features found in other survey tools. Survicate allows users to trigger targeted surveys across various locations of their website. 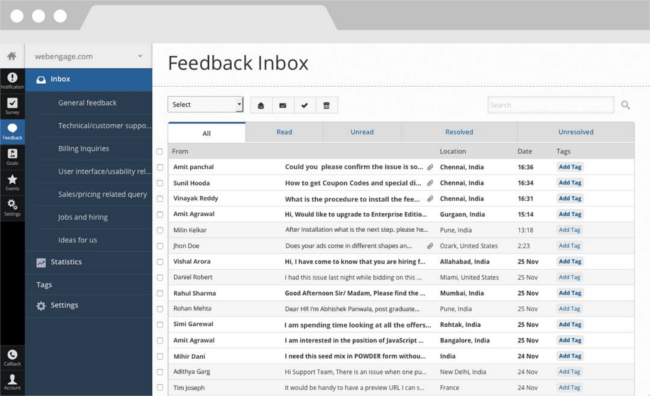 Users can also send out email questionnaires to different customers. In terms of creating these surveys, Survicate offers a library of predefined surveys that user can choose from. This survey tool also includes dashboarding capabilities, NPS analysis, and CSV and XLS exporting options. Unfortunately, however, Survicate does not provide any advanced analysis options. In other words, it’s purely focused on data collection. YesInsights is a survey software that assists you in building, deploying and collecting feedback. This software uses the short form survey, which is very easy to implement. It also offers a one-click poll widget that you can embed on your website and into emails to customers. One of the most commonly used metrics with this software is Net Promoter Score (NPS). In terms of analysis, however, YesInsights isn’t very advanced. Responses to each survey are organised in one chart where you can view individual responses. One of the more well-known online survey software and questionnaire tool, SurveyMonkey is used by millions of business all over the world. It provides its users with 15 different types of survey questions (including multiple choice, open comments and Likert scales). This tool is perfect for one-off surveys, however this makes it less suitable in terms of measuring overall satisfaction or re-surveying customers again after a certain period of time. KwikSurveys is a free (ad supported) online feedback survey which offers over 30 survey templates. Although you cannot customise these templates, they are easy to embed on your website. The types of questions you can ask in a survey are also quite limited (especially as there is no open answer option). The dashboard, however, is very easy to navigate and results can be exported as multiple file types. WebEngage offers users plug-and-play layouts, logically branched questions and customisation capabilities. This online survey software also allows users to target specific visitors based on behaviour. The tool also collects stats such as the number of people who attempted the survey, number that completed, detailed responses of each user and scheduled reports. Note: while very cost-effective, it’s important to mention that this tool is intended mainly for collection purposes and does not offer much in terms of analysis, e.g. text analysis. 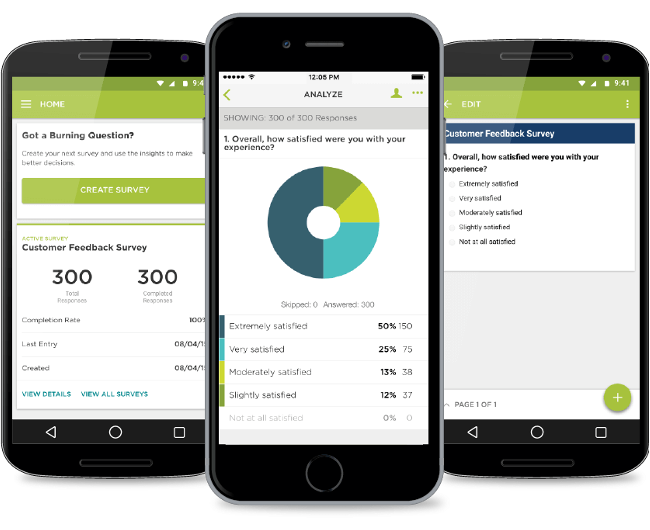 AskNicely is an online survey software that collects feedback daily using one-off surveys. This software can be integrated with your own CRM so that you can set up regular samplings or fast surveys and respond directly from your CRM. This tool, however focuses mainly on NPS. 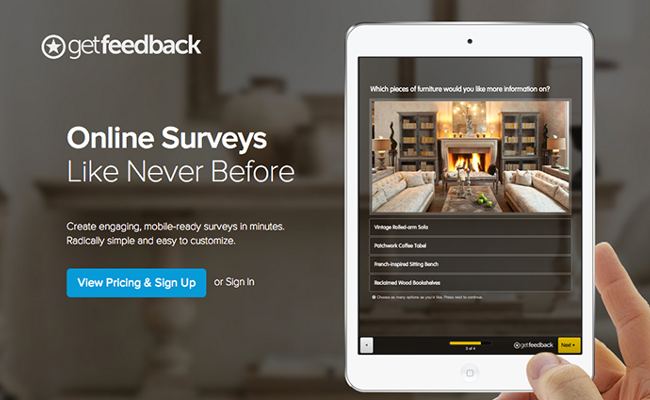 With GetFeedback, users can easily build branded surveys using drag & drop and a number of different personalisation features. It is also flexible in that it adapts to almost every platform that is used to distribute surveys. You can also integrate this tool with SalesForce, meaning the results of the surveys are also visible in your SalesForce dashboard. There are however, limitations in the flexibility of question types, data presentation and overall customisation. Honestly is a SaaS platform that enables service-oriented companies to send out surveys and questionnaires. There are two options within the software: Feedback Terminals and Web Integration. Web integration surveys allow you to send a feedback request using a link set in emails, QR codes or chat services. They also offer employee engagement surveys. Note: the survey editor and analysis capabilities are quite simplistic. Alright, so you’ve seen what you’re options are. Still unsure of which tool to choose? That’s totally normal. Choosing the right tool is very difficult for many teams and this is mostly because there are soo many to choose from! The important thing is to focus on which features and capabilities your business needs. These tools all make use of various collection techniques, collect different types of feedback, report differently and give you different user insights. I hope this article has provided you with some guidance in terms of choosing an alternative to Qualtrics.